Description: This coniferous tree is 50-100' tall at maturity and its trunk is 2-5' across. However, in the United States, this tree is usually smaller in size than it is in Eurasia. In pine plantations and dense forests, the trunk is tall and straight and the crown is relatively narrow (typically ovoid-oblongoid in shape). Specimens that are grown in open locations, however, have a shorter trunk and a wider ovoid crown that may extend close to the ground. Upper branches of the crown are ascending, while lower branches are widely spreading. The trunk bark is gray or grayish brown, rather coarsely textured, and fissured, while branches are gray and wrinkled. Twigs are terete, relatively stout, gray or grayish brown, and rather prickly in appearance as a result of detached fascicles (clusters) of needle-like leaves. The needle-like leaves occur in fascicles of 2 along the twigs and shoots; they can persist on a healthy tree for 3-7 years, creating a dense crown. The leaves are narrowly linear in shape (1-2 mm. across), 3-6" long, dark green, and sometimes slightly twisted or curved; they do not snap in two readily when they are bent. Austrian Pine (Pinus nigra) is monoecious, producing separate male (staminate) and female (pistillate) flowers on the same tree. The male flowers occur in catkins at (or near) the tips of twigs; these catkins are up to ¾" long, yellow, and cylindrical in shape. The female flowers are conelets that develop at (or near) the tips of twigs; they are either solitary or they occur in groups of 2-3. The conelets are yellowish green to red, ovoid in shape, and about ¼" long. The blooming period occurs during late spring or early summer for about 1-2 weeks; cross-pollination occurs by wind. Afterwards, the female flowers are replaced by immature seed-bearing cones that are about ¾" long by the end of their first year of development. 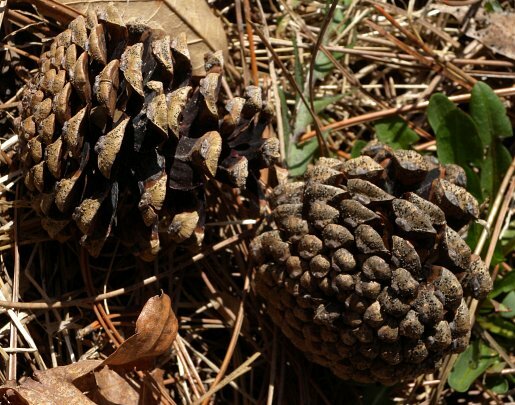 The cones don't become mature until the end of the second year of their development (during late summer or autumn), when they are 2–3½" long, broadly ovoid in shape (after the woody scales separate from each other), and yellowish brown to brown. The woody scales of each cone are oblanceolate in shape and slightly swollen toward their tips; they often have solitary minute prickles (often blunt, rather than pointed) on their upper sides toward their tips. The winged seeds are released by the cones and they are distributed by the wind. The bodies of individual seeds are up to ¼" (6 mm.) in length and their membranous wings are up to ¾" (20 mm.) in length. The woody root system is branched, widely spreading, and relatively deep. This tree reproduces by reseeding itself. Cultivation: The preference is full sun, mesic to dry conditions, and soil containing loam, clay-loam, some rocky material, or sand. 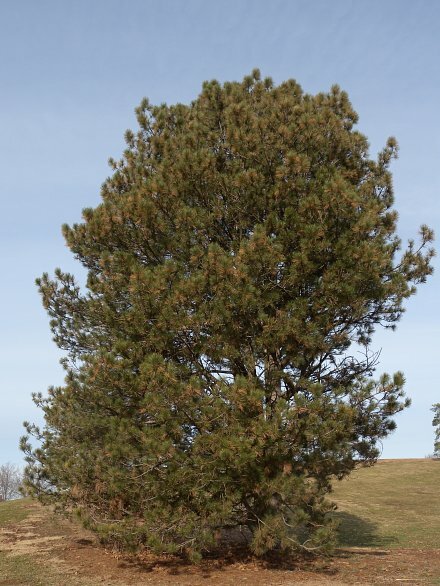 This pine tolerates drought, but it dislikes the hot weather that is typical of SE United States, preferring the cooler weather of NE United States and the Great Lakes area. Individual trees begin to produce cones at 15-40 years of age. Austrian Pine is more tolerant of air pollution and road salt than most pine species, and it is hardy to Zone 4. In the United States, this pine is vulnerable to various disease organisms, including Dothistroma Needle Blight (caused by Dothistroma pini), Lophodermium Needle Cast (caused by Lophodermium pinastrii), and Diplodia Tip Blight (caused by Diplodia pinea). As a result, this pine often suffers from premature needle-drop and branch die-back, especially after it reaches 30 years of age. Many trees die prematurely as a result. Range & Habitat: Naturalized populations of Austrian Pine are quite rare in Illinois, occurring at Illinois Beach State Park in Lake County (see Distribution Map), where it was planted more than 100 years ago. However, this pine has managed to reproduce itself successfully at this location, where it still persists. 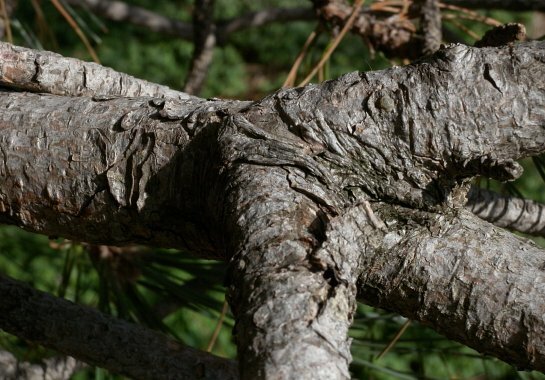 Austrian Pine is native to parts of Europe, SW Asia, and North Africa. In North America, it is used primarily as a landscape tree and for shelter belts. The habitat of this pine in Illinois consists of pine plantations and sandy savannas along Lake Michigan. In Eurasia and North Africa, it is often found in hilly woodlands and mountainous areas. Most Austrian Pine trees in North America derive from stock that originated from Austria and the Balkan states of SE Europe. Faunal Associations: In North America, many kinds of insects are known to feed on the foliage, wood, and other parts of Austrian Pine (Pinus nigra). These species include Tomicus piniperda (Common Pine Shoot Beetle), Pilophorus gracilis (a plant bug) and other plant bugs, Eulachnus rileyi and other aphids, Chionaspis pinifoliae (Pine Needle Scale) and other armored scales, and the larvae of Dioryctria zimmermani (Zimmerman Pine Moth) and other moths (Cranshaw, 2004; Wheeler et al., 1983; Blackman & Eastop, 2013; ScaleNet, 2014). Other insects that feed on this and other pines (Pinus spp.) include the larvae of long-horned beetles (Cerambycidae), weevils (Curculionidae), stink bugs (Pentatomidae), spittle bugs (Cercopidae), mealybugs (Pseudococcidae), larvae of sawflies (Diprionidae, Pamphiliidae), and the larvae of a butterfly, Callophrys niphon (Eastern Pine Elfin). Some vertebrate animals use pines as a source of food and shelter. The seeds of these trees are eaten by the Mourning Dove, Black-capped Chickadee, Red Crossbill, Red-breasted Nuthatch, Brown Creeper, Pine Siskin, Tufted Titmouse, Pine Warbler, and other birds (see the Bird Table for a more complete list of these birds). Among mammals, the Red Squirrel, other tree squirrels, and White-footed Mouse eat pine seeds, while the White-tailed Deer and Elk occasionally browse on the twigs and foliage of these trees (Martin et al., 1951/1961). Sheep also browse on their lower twigs and leaves (personal observation). Some birds also prefer pines as locations for the construction of their nests; this includes the Yellow-throated Warbler (Dendroica dominica dominica), Black-throated Green Warbler, Pine Warbler, and Blue-headed Vireo (Pearson, 1917/1936; DeVore et al., 2004). The Big-eared Owl and other owls often roost in pine trees during the day, particularly during the winter, because of the shelter and privacy that their evergreen foliage provides. Comments: When it is healthy, the Austrian Pine (Pinus nigra) can become a relatively large tree with a dense crown of attractive foliage. Unfortunately, it is vulnerable to various disease organisms in North America that can cause premature drop of its needle-like needles and die-back of branches. As result, this pine rarely achieves its full potential as a landscape and plantation tree in North America. Austrian Pine is similar in appearance to another introduced pine, Scots Pine (Pinus sylvestris). This latter pine usually has shorter needles that are often bluish green, instead of dark green, and the bark of its upper trunk and branches often peels away to reveal conspicuous patches of orange-red or red. Another species, the native Red Pine (Pinus resinosa), is also somewhat similar in appearance to Austrian Pine. 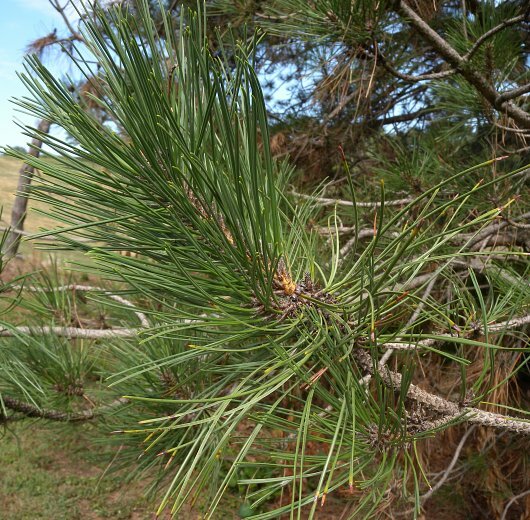 Red Pine differs by having needles that break cleanly when they are bent and its crown is usually less dense in appearance because its needle-like leaves persist on the tree for no longer than 3 years. The needle-like leaves of Austrian Pine, in contrast, can persist on the tree for 4-7 years, creating a more dense and leafy crown. The mature cones of Red Pine are typically reddish brown or brown and their scales lack prickles on the upper sides, while the mature cones of Austrian Pine are yellowish brown or brown and their scales usually have minute prickles (often blunt) on the upper sides. Another common name of Pinus nigra is European Black Pine.